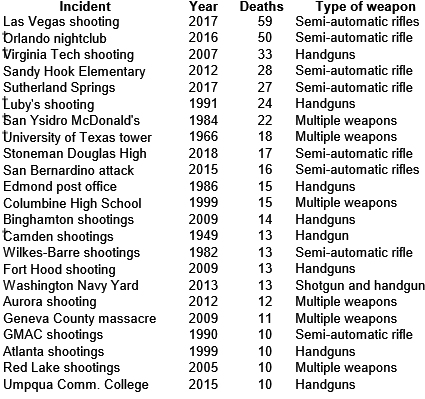 In the past 67 years mass shootings of more than 10 persons (including the killer) have claimed 453 lives, some seven per year, averaging one event every other year. Two massacres – Las Vegas (59 killed in 2017), and Orlando (50 killed in 2016) – account for about one quarter of all attacks. Seven of those mass shootings were in our schools, claiming 131 lives, since 1950. The U.S. has 139,126 schools, which means that – on average – a single school in a thousand will have a mass shooting death once every 67 years. In short, institutes of learning have always been extremely safe places for Americans. By comparison, 79 have been shot and killed in Chicago since the beginning of the year. A person is murdered every 18 minutes in that “gun-free” city; someone is shot every 4 minutes on average. Such facts mean little to politicians who smell votes or media that counts viewers and readers – bad news is good news for the profits of the penny-pinching corporations that run today’s networks and newspapers. For example, if federal law is changed by the fund-raisers in Congress, a 20-year-old security guard will be too young to buy a rifle in New Hampshire, while the same state’s laws allow her 13-year-old sister to marry. In Florida, the fuzzy-brained governor, Richard Lynn Scott, has decided that teachers will not be allowed to carry weapons to protect their students. Instead, the too-much sunshine state will allow librarians to be the gun-toting defenders of last resort, assisted by part-time maintenance workers. The immediate result of scare tactics about shootings is always negative for opponents of gun ownership. Gun sales zoom up in anticipation of regulation. Lawmakers in the know can call their stockbroker first, then start the panic. Remington shares, anyone? My solution to all this gun ownership is to use our tax system. If you, or your bodyguards, own a gun, then you will pay a permit tax fee of .001% of your earnings to the IRS. Poor people will pay little, not only since they need to protect themselves from rich people, but because where they live, there is generally more crime. If you make $30,000 a year, you will have to pay $30 per gun. If you sell the gun you pay nothing. If you try to hide your gun and don’t pay, it becomes a federal crime, and the FBI will hunt you down after investigating the case for several years. Criminals will also be subject to the tax unless they pay up or turn in their weapons. I do have another goal with this fee. If you make a million dollars a year, you will pay $1,000 for every gun you own, including guns carried by your security detail. Ten million dollars salary will equal $10,000 permit fee. And in Donald Trump’s circles, $100 million earnings will cost you $100,000 per gun. To really annoy the very rich at heart, all earnings will include dividends, inheritances, and any money that comes mailed to them using a postage stamp of the Cayman Islands. With enough money in fees we might be able to afford a really big wall or free healthcare for all – your choice. Two exceptions. In Florida, school librarians will be exempt, as well as part-time maintenance workers – but not the governor.